Happy Easter! 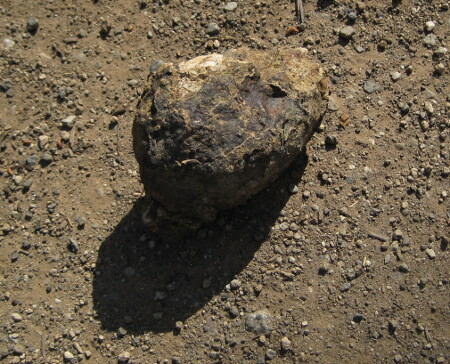 In keeping with the season, here's a dinosaur egg I spotted on a recent hike. Okay, or maybe it's just a vaguely egg-shaped rock. But there's been a lot going on this spring now that the weather is turning. First, we seem to have Eurasian collared doves nesting somewhere near our house. There's a dove up on the power pole, cooing, most of the day. I know I've heard lots of reports of collared doves around the south bay in past years, particularly down around Morgan Hill, but this is the first time I'd seen more than a glimpse of them here at home in San Jose. It's fun to see new species, though I hope these European interlopers don't push out the native mourning doves entirely. 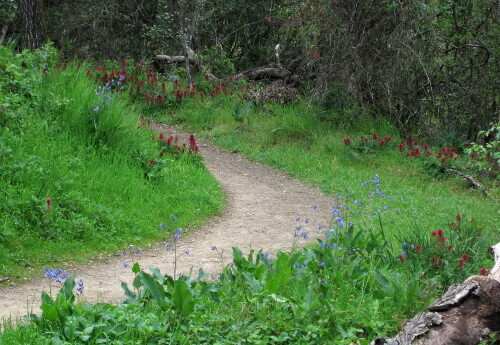 In addition, the wildflowers have been great out on the trails, especially around the south end of Windy Hill OSP and Coal Mine Ridge. A hike up there last week revealed nearly every wildflower on my wildflower page that could be in flower now -- California poppy, wild cucumber (intriguingly also called manroot), giant trillium, hound's tongue, milkmaids, the most impressive profusion of Indian warrior I've seen, blue larkspur, miner's lettuce, Sierra suncup, vetch (it's pretty despite the unfortunate name), red maid, wild radish, wood sorrel, broom, and my favorite, shooting star. Dave had to keep waiting for me while I argued with the camera over macro focus distances. 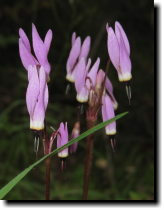 So if you like wildflowers, get out there and take a look!